This pair of women's mules or backless slippers is very stylish. They are made of rich velvet embroidered with silver-gilt thread. From about 1550 to 1700, domestic embroidery became very fashionable and mules were often decorated in this way. This pair have a medium heel and a square, slightly overhanging toe. This makes them typical of luxury indoor wear for women in about the middle of the 17th century. 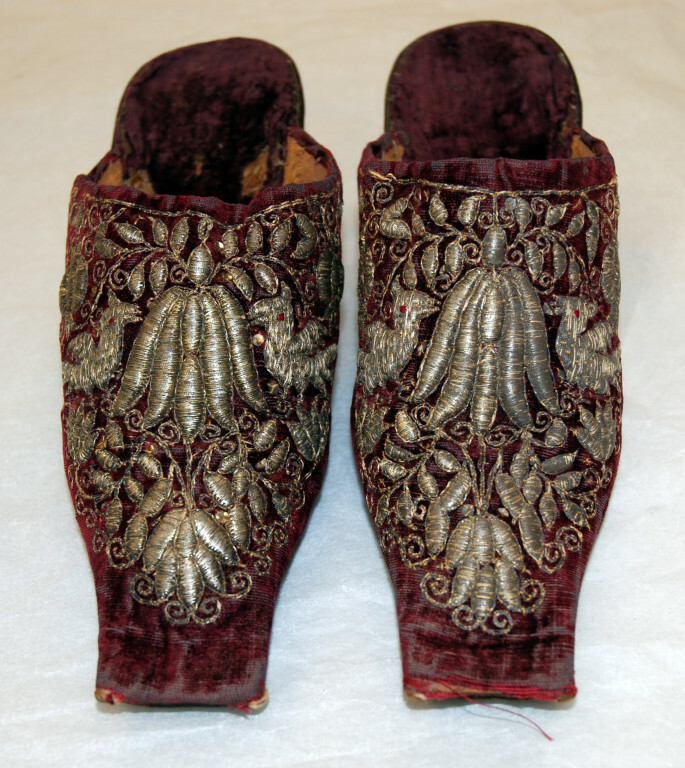 A similar pair of mules was made for Queen Henrietta Maria, wife of Charles I. Pair of women's shoes (mules) of red velvet embroidered with couched and raised silver-gilt thread in a design of birds facing a plant form flanked by floral decoration. The vamp is lined in leather and the sole has an inner lining of white leather. The heel insole is covered with red velvet. The heels are of leather and medium height. The toes are square. These stylish mules of rich velvet are embroidered in couched and raised gold thread. 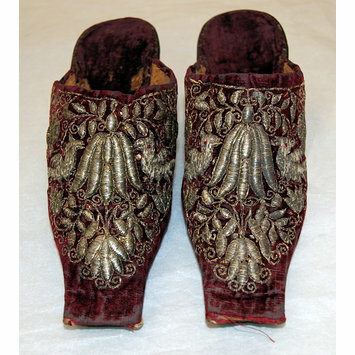 They are very similar to a pair of mules reputedly worn by Queen Henrietta Maria, wife of Charles I, in the collection of the Museum of London. Mules with medium heels were fashionable luxury footwear for wealthy women in the mid 17th century.